Mardy Fish with the trick shot winner Jacob Shelton. For kids, being a ball person is a dream come true. Being on the court and interacting with the some of the top players in the world is a special experience. For one lucky ball person, today was an especially memorable day at work. World No. 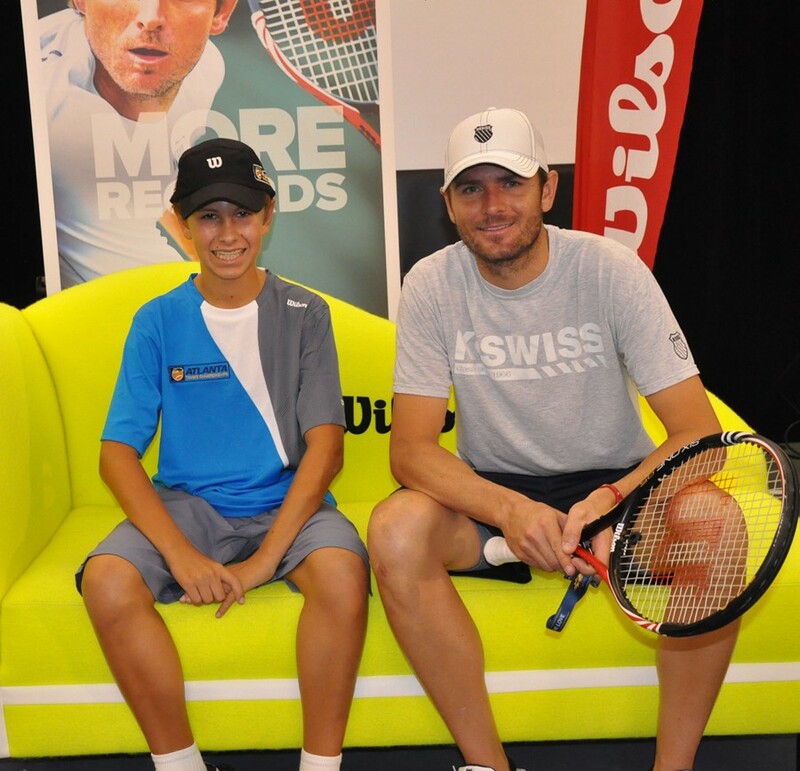 9 and top-ranked American Mardy Fish, along with sponsor Wilson, hosted a special event for the ball persons at the Atlanta Tennis Championships. Fish hit with the kids, answered their questions, posed for pictures and signed balls. The volunteers were told that there would be giveaways, but they were unaware of what the grand prize would be. The kids were hitting different trick shots and it was up to Fish to decide who had the most impressive tricks. As the kids showed off their trick shots, Fish was most impressed with Jacob Shelton’s skills and deemed him the winner. Shelton drew Fish's attention by bouncing the ball while doing a Russian dance with high kick steps. Then, he sealed the deal by bouncing the ball with his racquet between his legs. He won an incredible experience to travel with Fish to New York before the US Open, and be part of the effort to break the world record for the most people bouncing balls on their rackets at one time. Upon hearing that he would be travelling with Fish to New York for the event, Shelton was at a loss for words as he frantically tried to contact his parents to make sure he could go to the event with Fish. The following video is an interview with him after confirming his trip to New York, in which he discusses his winning trick shot as well as a discussion about why he loves being a ball kid. Though they are often overlooked, ball kids are an essential aspect of every tennis tournament. Year after year the kids return to work hard on court and provide their assistance for the vast number of matches throughout the week. Below are two interviews with two veteran ball kids discussing their experiences.